What's heavier--carbon dioxide or oxygen? Carbon dioxide versus oxygen... how can you tell which is heavier? Today, we will complete an activity to find out! First, let’s learn a bit about carbon dioxide and oxygen. Both carbon dioxide and oxygen are gases, and both of them are very close to what scientists call “ideal gases.” What is an ideal gas? An ideal gas has no interactions, are not influenced by outside forces and thus obeys the gas laws exactly (the gas laws basically state that there is a relationship between the pressure, temperature, and volume of any gas). In reality this is impossible, but carbon dioxide and oxygen come close! An oxygen molecule has a mass of 15.999, which we can round up to 16. A carbon molecule has a mass of 12.011, which we can round down to 12. If oxygen is written as O2, what do you think you do to find the weight? One oxygen molecule has a mass of 32. How heavy is a molecule of carbon dioxide? If a molecule of carbon dioxide is written as CO2, what do you do to find the weight? There are two molecules of O in CO2 and 1 molecule of C in CO2. One carbon dioxide molecule has a mass of 44. Now, try out this activity to see these equations in action! An adult to help you out! 1. Ask an adult to light a candle. 2. Measure 1 teaspoon of baking soda and dump it into one of the clear glasses. 3. Measure 1 tablespoon of vinegar and dump it into the glass with the baking soda. 4. Wait just a minute! CO2 gas is being created! 5. Pick up the bubbling glass and “dump” the gas into the second empty glass. Make sure to not actually dump any liquid! If you are confused, watch the video above to see how to do this. 6. Pick up the glass full of CO2 and pour it onto the burning candle. 7. Whoa! You should have seen the candle go out. Why did that happen?! The acetic acid in the vinegar reacts with sodium bicarbonate in the baking soda to form carbonic acid. Carbonic acid is unstable in nature, so it breaks down into carbon dioxide (CO2) and water (H2O). This is a decomposition reaction. A decomposition reaction is a chemical reaction in which a compound breaks down into two or more elements or new compounds. This works well for splitting a compound into two elements, such as when water splits into hydrogen and oxygen. In this case, though, the decomposition reaction caused the carbonic acid to break down into two compounds (remember, compounds are two or more elements combined). The bubbles formed in the glass during the reaction are the carbon dioxide escaping! As you saw, the carbon dioxide gas is what put out the fire. When the glass with escaping carbon dioxide comes near the candle, the fire is extinguished. Since fire needs oxygen to survive, when you poured the carbon dioxide onto the flame, the CO2 displaced the oxygen, thus putting out the flame. This method is actually used in some fire extinguishers (others use nitrogen). Still want to know more? Here are 10 different ways of explaining why carbon dioxide is heavier than oxygen! Share your thoughts and ideas about math on our new math forum! 9 Apples Math Card Game is now hosting a forum all about math! Share ideas about math, what inspires and fascinates you in the math world, what you wish could be improved in mathematics education, and ask questions about what we can do to educate kids and communities all about math! Visit 9apples.weebly.com to join the discussion! Are you right-side dominant or left-side dominant? Find out! I’m guessing you all know that most people are either right-handed or left-handed. The people in the world who use both hands equally are ambidextrous. This is pretty rare. If you are truly ambidextrous, you are a part of the 1 percent of the population who has equal left and right-hand dominance. The majority of the population is right-handed (about 70-90 percent). Have you ever heard anyone refer to being right-brained or left-brained? We have two hemispheres of our brain. As you can see in the diagram below, your right hemisphere controls your left side and your left hemisphere controls your right side. Based on split-brain studies on people who had their hemispheres separated for epileptic treatment in the ‘60s, scientists determined that right-brained people were more creative, while left-brained people were more analytical and detail-oriented. The truth is, we all use both hemispheres of our brain, as the two halves are connected by a cord of nerve fibers called the corpus callosum and communicate between each other. The terms “right-brained” or “left-brained” are really more descriptions of your personality traits than they are scientific terms, although scientists still agree that the left and right hemisphere certainly process information differently. For example, language functions in the left hemisphere while voice tones function in the right hemisphere. In this way, both hemispheres work together for you to have a conversation with someone. Play the split-brain experiments to learn more about past studies and results on the left and right hemispheres of the brain! CLICK HERE to play the Split Brain Experiments! While you probably recognized whether you were right or left-handed at an early age, you might not know that you can also be right-footed, left-eyed, or left-eared! How do you figure out your sidedness? First, test your eye! Which eye do you use to wink? Which eye do you use to look through the paper towel tube? Record your results. Hold your hands out at arm-length and create a circle with your fingers. Look through the circle at a distant object. Now, close your left eye. Open it and close your right eye. Did your view ever change? If it changed when you closed your left eye, you are left-eyed; if your view changed when you closed your right eye, you are right-eyed. Record your results. Which hand do you use to write your name? Pick up a cup of water? Throw the ball? Record your results. Kick the ball. Which foot did you use? Run and take a leap. Which foot did you leap off of? Record your results. Analyze your experiences. Are you more left or right sided? Where you left sided in some situations and right sided in others? Now, find out whether your friends are left or right sided! Test as many people as possible to get more accurate results. A larger number of test subjects is more representative of the population you are testing. Let’s try some new objects to test with! 2. Ask your participant to do the following, and record the results in your table as they complete the tasks. 3. Tell your participant to write their name. Which hand did they use? 4. Place a coin on the floor directly in front of your participant and ask them to step on the coin. Which foot did they use to step forward? 6. Tell the participant to look through the paper towel tube at a distant object. Which eye did they use to look through the tube? 7. If you have time, continue testing! What other objects or experiences would help you determine sidedness? Take a look at your results! Time to get analytical. What did you find? What do those numbers mean? Is right-footedness associated with right-handedness? Were some people a mix of left side dominance and right side dominance? What might this mean? Report your results in an informational paragraph or create a visual. Does this song smell purple? 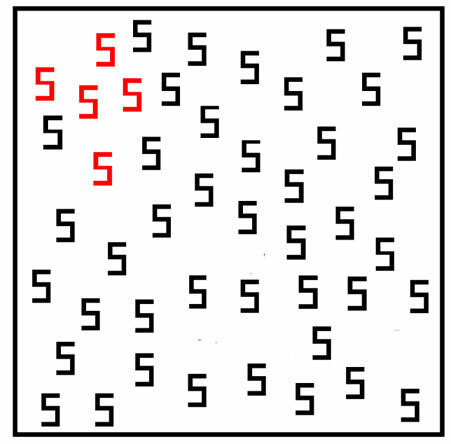 Synesthesia: The condition of one cognitive stimuli involuntarily triggering an additional pathway. Imagine hearing your favorite song and seeing the color purple, eating a turkey sandwich and seeing yellow, or seeing red whenever you feel alarmed. As wild and unreal as this sounds, these kinds of experiences actually happen to some people! There is nothing wrong with you if you have these unique color associations--you just have synesthesia. Synesthesia is a condition that causes you to experience some senses simultaneously. A very common form of this trait is to always see specific letters or numbers as a certain color. For example, I might always view the letter A as green, B as blue, C as turquoise, etc. Learn more about synesthesia HERE. Read about Carey’s real-life experience with synesthesia. How do you know if YOU have synesthesia? Let’s try something out! What did you notice after looking at the first test card? If you’re like me, you identified the red numbers immediately without having to really search for them. 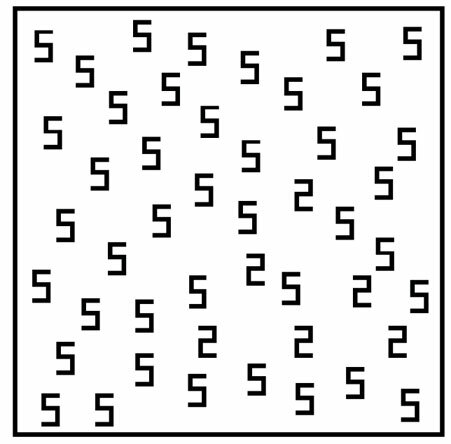 Your eyes are just drawn to the difference in color right away, and it didn’t take any effort to “find” the red numbers. What was different about your experience with test card 2 versus test card 1? If you DON’T have synesthesia, you would have found it more difficult to identify the differences in numbers. Sure, you could do it, but it just took a little more time. This is because all the numbers were the same color, so your eyes had to work a little harder to identify the differences. If you DIDN’T have any trouble identifying the differences and the numbers were just as clearly separate as they were in test card 1, then you probably have synesthesia! Remember, this is NOT a disorder or a bad thing to have--you just experience the world a little differently! Now that you understand the synesthesia testing process, try testing out your friends and family members! Your goal is to determine whether your participants have synesthesia, but also to identify whether certain letters or numbers are associated with certain colors for most people. This may be a cultural phenomenon and would be interesting to discover! For example, if the majority of your participants associated the color red with the letter F, you might infer that that reaction relates to an F letter grade written in red pen. Of course, you would only create this association if your cultural background includes that experience. Just as you already did yourself, show your participant test card 1. Have your participant point out all the numbers that are different from the majority. How long did it take your participant to discover the red numbers? Most people will be able to point them out immediately. Ask your participant how difficult it was to identify the red numbers. Record the response. Now, have your participant look at test card 2 and identify the numbers that are different. What was your participant’s reaction to test card 2? Did it take longer to identify the numbers? Ask your participant whether it was more difficult, less difficult, or the same level of difficulty to identify the numbers that were different in test card 2 versus test card 1. If your participant answers that test card 2 was the same difficulty or less difficult than test card 1, he/she likely has synesthesia! Repeat steps 1-5 for as many participants as you would like to use. The more participants you have, the better your results will be! It is always more accurate to use more participants, as a larger number will be more representative of your population. 8. If you did not find that any of your participants had synesthesia, that’s ok! Less than 0.5% of people have this unique trait, so your chances of finding someone who has synesthesia are pretty slim. Extension: What colors do people associate with numbers? This is an interesting study to complete, even if none of your participants had synesthesia. You might find out that people commonly relate certain numbers to certain colors. For example, people might commonly associate the number 1 with blue or gold, as first place ribbons are blue and first place medals are gold. Test it out! Generate a random list of numbers. Read the number and have your participant say the first color that he/she thinks of. Record the responses. Repeat step 2 for each participant. Generate a second list using the same numbers, but in different order. Repeat step 2 and 3 with this new list. Analyze your results--did your participants create the same associations in the second round as they did in the first? Did the participants come up with the same associations as each other? 8. Finally, make inferences about why certain colors were associated with certain numbers for most people. 9 Apples Card Game is Here!! We are happy to announce the arrival of the official 9 Apples Card Game!! equals zero to end the game! equations, and earning more points! as you exercise your higher math!